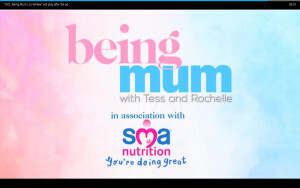 We have been contacted by supporters concerned that Nestlé is promoting its SMA infant formula brand to mothers through sponsorship of AOL’s online Being Mum videos. We are taking this up with both Nestlé, AOL and the relevant authorities in the UK and internationally (make a donation to help us do this work). The Infant Formula and Follow-on Formula Regulations (2007) prohibit advertising of infant formula brands. The Department of Health Guidance Notes for the Regulations state advertising must not: “promote a range of formula products by making the brand the focus of the advert, rather than specific products”, which is exactly what Nestlé is doing in the branding on the AOL page (example above) and the advertisements that precede the films. Update: Nestlé responded saying it is confident it complies with the law (see below), but it appears that AOL has removed the SMA advertisement from the video clips, though the SMA logo still features on its Being Mum page. For example, the screenshot from the Jo Whiley film clip on 21 July shows the interview came after an SMA advertisement (click on image for larger version). This advertisement no longer appears on the film clip – it looks like another campaign victory! (though the SMA infant formula logo should still go from the webpage). Nestlé’s also breaks internationally agreed marketing standards intended to protect all mothers, however they feed their children. It is for health workers to support parents, not companies with a vested interest in selling formula. Remember, we have won cases at the Advertising Standards Authority against misleading claims made for SMA milks. We earlier showed that the claim SMA is the “best formula” is simply untrue (nor is it Aptamil “the best”, we also won a case against that claim). If you want to send a message to Nestlé calling on it to respect the rules you can do so using its new “Tell Us” webpage. Follow the link to Nestlé’s “Tell Us” page and let’s see if it will take action (let us know if you get an answer – see the answer we received below). Nestlé’s Global Public Affairs Manager contacted me this month encouraging us to use this “compliance reporting system”, saying: “I feel that such a direct approach leads to more constructive actions and prompt remediation where needed”. Well, why not give it a try and see if Nestlé will promptly cancel this blatant breastmilk substitute brand promotion, which violates the International Code of Marketing of Breastmilk Substitutes? “Mums are now more than ever turning to digital and social platforms to find useful, helpful content, supporting them as a mum. You can also leave comments on the AOL channel calling for it to stop promoting a formula brand – though keep the focus on the need for independent support for mothers. Calling on companies to abide by the marketing rules is not an attack on mothers who use formula – the rules are there to protect all mothers. The International Code of Marketing of Breastmilk Substitutes was adopted in 1981 by the UN’s health policy setting body, the World Health Assembly (WHA). Nestlé pretends to follow the Code and the subsequent WHA Resolutions, but in reality treats them with utter contempt. Nestlé’s response to the latest global monitoring report Breaking the Rules 2014 produced by our partners at the International Code Documentation Centre is to dismiss 90% of the violations we report. Nestlé’s says the practices we report comply with its own policies – but Article 11.3 of the Code says very clearly manufacturers and distributors should ensure their practices at every level comply with the Code’s provisions. See my recent blog for analysis of Nestlé’s response and what we are doing to persuade it to bring its policies and practices into line. Nestlé entered the UK in 2012 with the takeover of the SMA brand and has recruited a network of marketing staff. The job description for its Clinical Representatives is to gain SMA brand endorsements from health workers by targeting them where they work. Where it is barred from doing so by hospital rules, it sets up its own events at nearby hotels and tries to persuade health workers to go there. Health worker endorsements are one way to promote its infant formula. This new initiative with AOL is another way. We have been telling Nestlé for years to abide by the rules, but find it is pressure from the Nestlé boycott, shaming campaigns and binding regulations that are need to force changes. To help us continue this work, please join, donate or buy something from our Virtual Shop. Thank you for contacting Nestlé with your concern. Nestlé complies fully with the UK regulations relating to the marketing of infant formulas. We are confident that the Being Mum activity and the association with AOL is compliant.